Rewards Canada: November 9 Update: 10x Plum Points at Chapters Indigo (tie in with other offers), $75 Statement credit for SimplyCash Preferred via Amazon + more! November 9 Update: 10x Plum Points at Chapters Indigo (tie in with other offers), $75 Statement credit for SimplyCash Preferred via Amazon + more! Chapters Indigo have launched a new 10x Points offer on all purchases over $40 in store or online. If you do the latter, wait until tomorrow as you can earn 10x Plum Points AND 10x AIR MILES for those purchases. Or make your first purchase via Marriott Rewards More and score 1,000 Marriott Rewards Points plus the 10x Plum Points. Those aren't your only options so we recommend checking out our Top 6 tips for maximizing miles & points earning on your holiday shopping that we updated and re-released today for the upcoming holiday season! 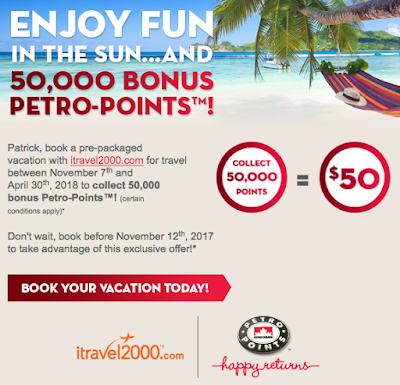 Petro-Points and iTravel2000 have teamed up once again for another booking bonus. 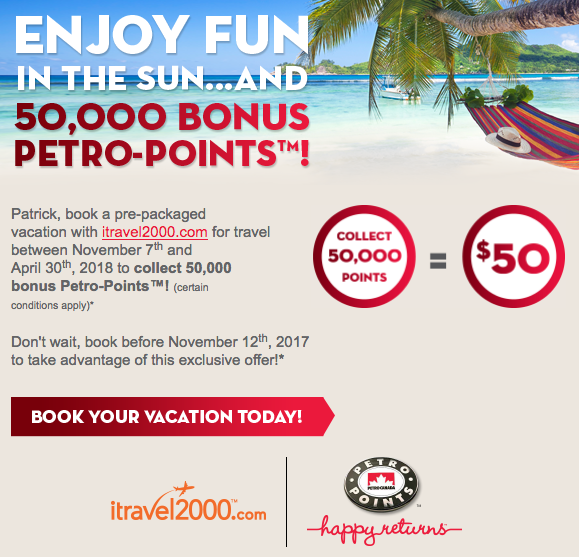 If you book a pre-packaged vacation by November 12th you can earn 50,000 bonus Petro-Points. Those points are worth $50 so you can look at this as being a $50 rebate on your booking. Find out more here. Air Canada is the first Canadian airline to use virtual reality technology to simulate the experience of flying on its Boeing 787 Dreamliner for travel agents and potential customers. Through a fully immersive, interactive experience, users can explore all three cabins of service offered on board the aircraft, including enjoying a virtual International Business Class meal complete with wine in an Executive Pod. Air Canada Pop-Up Poutinerie, Shoreditch, London (UK), until November 11, 2017. EY Entrepreneur of the Year National Gala, The Ritz-Carlton, Toronto, November 30, 2017. If you have been eyeing Canada's Top Cash Back Credit Card, The Simply Cash Preferred Card from American Express, you may want to get it right now. Amex has partnered with Amazon to offer a $75 statement credit if you spend $75 at Amazon.ca with the card. This is on top of the standard sign bonus of 5% cash back for the first 6 months (up to $300 back) and 2% back on all purchases. Find out more here. Check out the Give A Mile Flight Hero campaign! The charity can really use donations of miles to help provide flights to those who otherwise would be unable to travel to visit terminally ill or critically sick family and friends. Rewards Canada has pledged to raise 100,000 miles and we are half way there! We are putting the call out to all of our fans, readers and even new visitors, if you can give please do so. It can be as little as 1,000 miles! You can find out more and donate here. Looks like things are shaping up but there is still a long way to go! Be sure to donate today! Remember to visit Rewards Canada's Travel Booking site to book travel directly with many of your favourite airlines, hotels and more! No Canadian specific offers today other than those listed above! Air Canada adds six new routes to the U.S.